WLD21295 Wildo Fold-A-Cup Small Black. WLD21296 Wildo Fold-A-Cup Large Black. 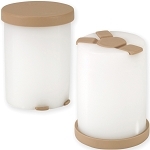 WLD21368 Wildo Spice Shaker Tan.